I've been on a soup kick ever since Thanksgiving. This past week I've made Minnesota Wild Rice, a Tunisian Vegetable-Garbanzo Bean with Spicy Harissa, and a New Orleans Farro Gumbo. 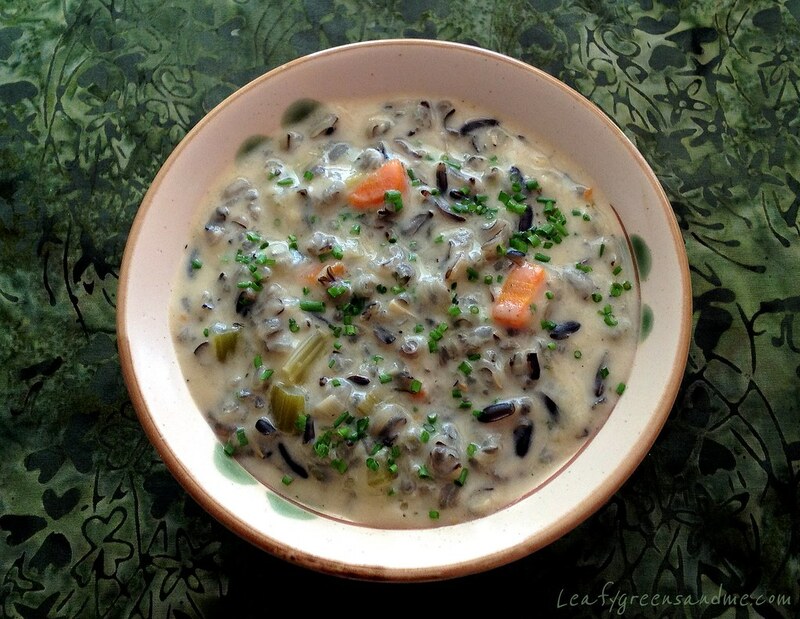 But wild rice soup is definitely one of my favorites. I just love the texture and the nutty flavor. Plus it's gluten-free and packed full of nutrients such as B vitamins niacin, riboflavin and thiamine, as well as potassium and phosphorus. It is also considered a complete protein, containing all of the essential amino acids. Unfortunately, most stores sell a cultivated-hybrid version of wild rice, which is what I used. But I'm definitely going to seek out the real deal even though it's more expensive so that I can do a comparison. Either way--it's definitely a grain that you want to keep in your pantry and use often! In a large dutch oven or stock pot, heat olive oil and add leeks, garlic and thyme and cook until leeks are soft, about five minutes. Add dry sherry and reduce for a couple of minutes and then add vegetable stock, along with flavored seasoning (if using). Bring broth to a boil and stir in brown rice along with celery and carrots and salt and pepper to taste. Reduce to a simmer and cook until rice is tender about 45 minutes. Five minutes before serving, whisk together cashew cream or soy milk with cornstarch and add to soup, stirring slowing for about 3-4 minutes until soup thickens. Check for seasonings and add more salt and pepper to taste. Drain cashews and place in a blender along with filtered water and blend on high for about 4 minutes until creamy. Strain mixture. You should have about 3/4 cup of cream. If less, add additional water. I have been on a soup kick too! It seems every other recipe I post is about soup; your recipe looks wonderful and super creamy, can't wait to try it!